I never had tried Pearl Barley before. I knew it was a new substitute for rice, and when I found this recipe for a Pearl Barley Risotto I decided that I had to try it. I found this recipe in a cookbook I received for Christmas Ottolenghi’s Jerusalem. I have to admit that I am not really a recipe follower. Rather I take inspiration from different recipes, consider the method and different flavors and then adapt it to whatever I have in the fridge at the moment. This recipe is surprisingly easy to prepare. 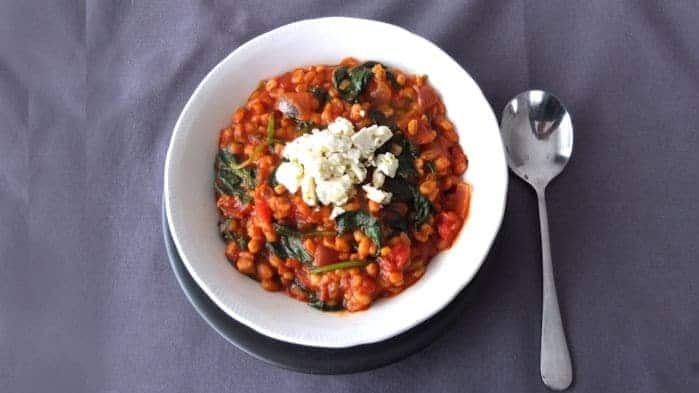 I was hoping that the Pearl Barley could act as a low carb rice substitute, but from looking at some of the other nutrition website it does not seem to be the case. However this dish is heavenly creamy, filling and full of flavors. I will put this in my vegetarian drawer ready for my father-in-law’s next visit. Melt the butter in a large flying pan with 2 table spoons of olive oil and fry the onions and garlic on a low heat for 5 minutes or until browned. Add the barley, thyme, paprika, bay leaf, zest, chilli flakes, tomatoes, stock, passata and salt to the pan. Bring to boil and then reduce heat and leave to simmer. Leave to simmer for about 45 minutes or until all the liquid is absorbed and the barley is tender. Before taking the risotto off the heat stir in the spinach leafs. (They only take 2 minutes to cook). 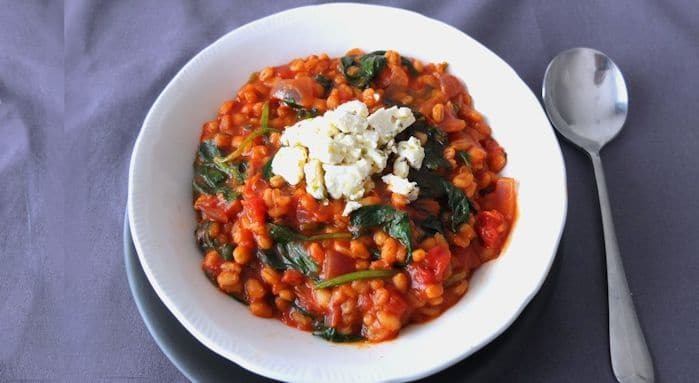 Place the feta into a bowl. Add 1 table spoon of olive oil and mix in the oregano. Once the risotto is cooked add salt and pepper if desired. Divide into bowls and top with the feta mixture. 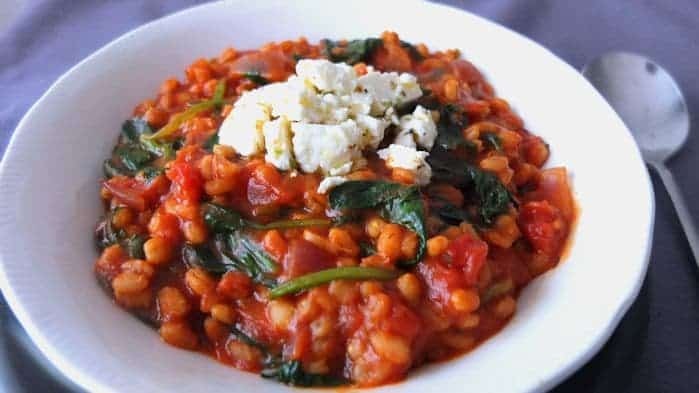 6 Responses to "Pearl Barley Risotto with Tomatoes, Spinach and Feta"
I love pearl barley, and I love love love Yotam Ottolenghi 😀 I haven’t tried this recipe yet but it looks really good – I’ll have to bookmark it for future reference. I like it! I’m sure together with the feta an interesting mix of flavours!! Thanks! Have a go. It was surprised how easy this recipe was. Glad you like it.